$1.00 Off per person for up to 4 players. Professor Hacker’s first surprise was the discovery of an old mining train. Take the mining car to the top of the mountain and follow Professor Hacker. Putt your way through a fun and exciting expedition with caves, waterfalls & other adventures. Two 18 hole Miniature Golf Courses. Professor Hacker’s first surprise was the discovery of an old mining train. Take the mining car* to the top of the mountain and follow Professor Hacker. *A Mining Train that takes yIn the 1920’s Professor Duffer A. Hacker, led expeditions to the Fogclift Islands off the coasts of South America, searching for gold and diamond mines. He discovered an old, World War I mining train built by the Germans. Now you can take this mining train to the top of the mountain and follow Professor Hacker’s adventure as you putt your way Professor Hacker’s Lost Treasure Golf. 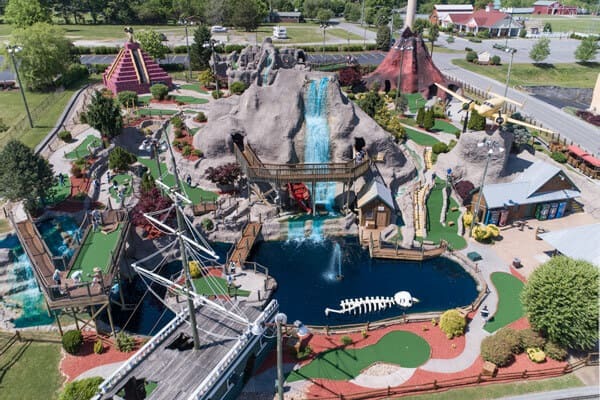 Lost Treasure Golf features two 18-hole miniature golf course that provide a world of entertainment in the middle of Pigeon Forge. You will putt through waterfalls, caves, a Mayan-like temple, a volcano and a pirate ship as you search for the golden hole-in-one! The scenery is spectacular and sometimes distracting, but if you preserver like the Professor, you can receive a PH.D in Golfology by scoring a hole-in-one on the final hole and winning a free game!